On 14th February 1980, THE DOROTHY NEAL WHITE COLLECTION, a retrospective collection of books for children and young people published prior to 1940, was opened at School Library Service in Wellington. 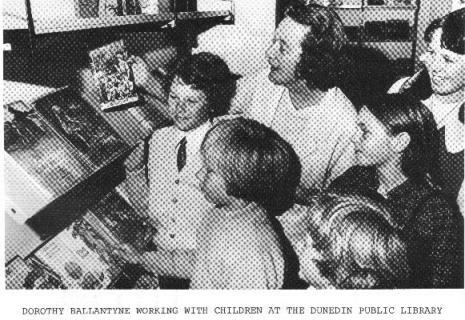 It was so named to honour Dorothy Ballantyne, an outstanding contributor to the world of children’s librarianship and the study of children’s literature in New Zealand and overseas. Her wish was to use her first married name, under which she published two internationally acclaimed books: About Books For Children, published in 1946 by the New Zealand Council for Educational Research in association with the New Zealand Library Associ­ation, and Books Before Five, published in 1954 by the NZCER, and later reprinted. Dorothy Neal, born in Dunedin, studied librarianship at the Carnegie Library School in Pittsburgh in 1937, in the days before New Zealand had its own Library School. On her return to New Zealand she became Children’s Librarian at Dunedin Public Library. She worked there from 1937 until 1944 and again from 1956 to 1974. Between these times she combined raising a family with tutoring, examining, writing and the founding of an advanced course of study for a certificate in Children’s Librarianship. Many of the original books in the Collection come from Dororthy Neal White’s own Dunedin Public Library collections. Her energy and enthusiasm have made a significant contribution towards persuading authorities to spend money on books for children’s libraries. Her encouragement of reading amongst children, her influence on parents and teachers, her study of writing for children for which she is regarded highly internationally make it very appropriate that her name should be associated with a collect­ion which, it is to be hoped, will provide a basis for further study and research into writing for children. The books that formed the basis of the D.N.White collection, accumulated over the years and were stored at School Library Service. Many originally came from Dunedin Public Library. Others were donated by school libraries as library advisers kept a weather eye on weeded stock with a view to the establishment of a representative retrospective collection. Enormous numbers have been donated by people who wish to see the books they remembered from their childhood preserved and used. On 11th February 1980, THE DOROTHY NEAL WHITE COLLECTION was officially opened and was available for study. Some of the books were catalogued. When School Library Service moved out to Tawa, it was housed in the Conference Room. The entire collection was sorted, weeded and catalogued and the policies to shape the collection were defined. 1982 saw the formation of The Friends of the Dorothy Neal White Collection. The resulting publicity yielded many more donations, adding greatly to the collection. The Friends pay an annual subscription (currently $10). This provides the means to actively shape the contents and follow acquisition policies, which will enable the collection to become truly representative. Policies are now being set to further define priorities, and to ensure that the collection is as comprehensive as possible. The death of Phyllis McDonald, the Director of School Library Service, in 1984, was deeply felt. It was largely due to her energy and vision that the collection evolved from heaps of books in boxes to become an organised and catalogued collection. The records of the collection are now being fed into the National Library’s database so the holdings will be known to library users wherever they have access to the database, though of course books cannot be borrowed. The need for the collection had been recognised long ago. The possibilities for research amongst its holdings are wide ranging. Books reflect the social conditions and customs of the times in which they are set or written. They reflect attitudes ‑to the children themselves, to women and men, to people in varying conditions of life, to the mile­stones in life‑ birth, death. They reflect the historical events of the time, seen with contemporary eyes and not with hindsight. Changes in styles and the subject matter considered suitable for children make an intriguing study. A particular emphasis in the collection is on New Zealand material ‑ books written by New Zealanders; published in New Zealand or containing New Zealand references. Again, the view of life as presented during the time of New Zealand’s settlement is fascinating and these books are not likely to be collected elsewhere. The next issue of NOTES ‑ BOOKS ‑ AUTHORS will feature EDITH HOWES. The illustration below is from Maoriland Fairytales : 1914. The collection consists mainly of monographs published in late Victorian and early Edwardian times. A few early comics, annuals and periodicals are included, and a selection of non‑fiction. Popular adventure stories such as those of R.M. Ballantyne, W.H.G. Kingston, Edward S. Ellis and G.A. Henty are well represented; though two titles by W.H.G. Kingston have so far proved elusive. They are Holmwood, OR The New Zealand Settler and Waihoura, OR The New Zealand Girl. A long vacation by Jules Verne has also proved unobtainable. School stories abound, for example those by Gunby Hadath, Angela Brazil and Elsie J. Oxenham. Many popular authors are well represented ‑ they include Mrs Molesworth, Ethel M. Turner, Mrs Ewing, Esther Glen, Mary Grant Bruce and Edith Howes. Others, often presented as Sunday School prizes, demonstrate the urge, so prevalent at the time, to inculcate moral values in children. These stories were dramatic, often tragic and intensely sentimental with heavily intrusive morals. The books of Randolph Caldecott and Leslie Brooke are well represented. The New Zealand content however is very small and we would very much like to remedy this. Betty Gilderdale in her A SEA CHANGE : 145 YEARS OF NEW ZEALAND JUNIOR FICTION lists 179 titles published before 1940. The collection holds only 31 of thes: mostly by Esther Glen and Edith Howes with a few by Isabel Maude Peacocke. The collection is at present housed at School Library Service, Head Office, 212 Main Road, Tawa, Wellington. Hours of opening are 8:30am‑5:30pm Monday to Friday. There are limited study facilities. Books are available for study or research but will be issued only in exceptional circumstances. School Library Service also has a comprehensive coverage of publications for children and young people from 1940 which enables researchers to update their investigations, and to examine in one library an extraordinarily wide range of publications for children. There is also a small loan collection of duplicates available to schools. These provide excellent background for social studies topics with their depiction of other times and societies, attitudes and customs. The Dorothy Neal White Collection will be housed in the National Library building in Molesworth Street, when it is completed in early 1987, together with the post‑1940 collection. It will, however, be maintained as an entity, apart from, but side by side with, the large and active National Children’s Collection and will be available for consultation on the premises by students, research workers and the general public. The systematic development of the collection will be in accordance with the National Library’s role of collecting and preserving appropriate material for research and making them readily accessible. In time it is proposed that a specialist position will be created and the duties of this librarian will include the maintenance of the collection, the search for material not already held, and the acquisition of material to fill gaps. The aim will be to build a collection representing all types and phases of writing for children of the English­speaking world, from the middle ages until the present day. It is not the intention to collect text books, nor books about children written specifically for adults, but to include books which though intentionally written for adults, may have entertained or amused children of the era. The emphasis will be on books of imagination, for pleasure and amusement, not those intended purely for didactic or instructional purposes. 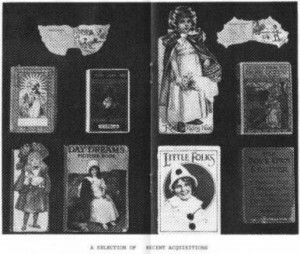 Specifically, we hope to acquire as comprehensive a collection as possible of New Zealand material, and possibly Australian books, realizing that material from these two countries should be more easily obtainable.than books from Europe and North America and that these books will be more typical of the reading material of young New Zealanders of the last century and the early part of this one. Idealistically we would hope at some ‘time to acquire some works representing the seventeenth and eighteenth centuries, but in a country whose published history began so late, our aspirations must be realistic. As the planning for the National Library building proceeds, further information will be available about the development of the collection. 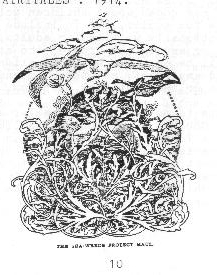 The initials stand for A LADY OF ENGLAND, the pseudonym of Charlotte Maria Tucker, who, between the 1850s and the 1890s, wrote over 150 stories which were widely read by Victorian children. A.L.O.E. was born on 8 May 1821 in Barnet, Herts., one of ten children of Henry St.George Tucker, an Indian civil servant who later became Chairman of the East India Company. She began to write stories as a child and continued on into her youth as a form of entertainment for her family and friends. During this period she also became a devout evangelist, and after her father’s death in 1851 she decided to incorporate religious and educational themes into her stories and have them published in order to ´benefit´ young readers. At the age of 54, she went to India as a missionary. She never returned to England and died at Amritsar on 2 December 1893. Her stories emphasise the typical Victorian themes of ´the importance of family ties´, ´the holiness of filial duty´, ´the fitting rewards of industry and punishment of indolence´, ´the honest pluck of the poor´ and the ´awful burden of the rich and privileged´. As Patricia Demers says in her book A GARLAND OF THE GOLDEN AGE , ´not surprisingly A.L.O.E.’s books were very popular as Sunday School prizes´. A selection of her most popular titles (only the cream of her prodigious output).